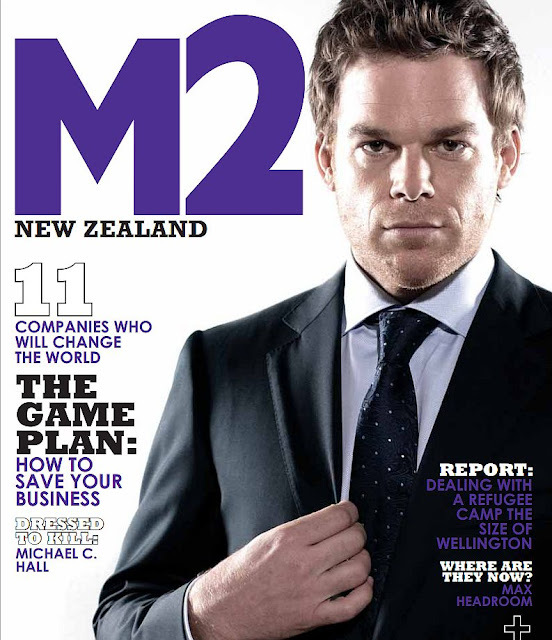 Michael C. Hall is on April's 2012 cover of New Zealand's M2 Magazine. Check out a preview of the magazine, here. I am confused by Michael's movie choices. Why is he choosing to act in these second rate movies? I really think he could be regarded like Johnny Depp or George Clooney. Like super cool...but the Bliss movie was not good. Sorry:( get a new agent!! Well, this was something he did through a friend. much like Daniel Craig's awful "Flashbacks of a Fool". I remember MCH signing for a couple of very interesting projects - James Manos,jr. 's "Love, Scotch and Death" (with Vera Farmiga), and "The Dead Circus" with the newly Oscar minted Melissa Leo and James Marsden. Then, nothing. So, it looks like luck plays a part as well. Dexter Season 7 is shooting early, so I'm hoping this is because MCH has one of these movies lined up. Johnny Depp and George Clooney don't do cool movies..... I don't think MCH has any ambitions to be a huge movie star.